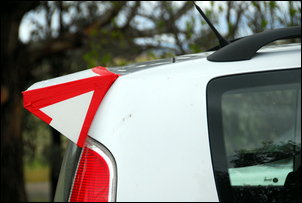 Many small cars these days use a ‘square back’ configuration – that is, they have a near-vertical tailgate. Because of their rear shape, they have a large wake of disturbed air pulled along behind them. The result is relatively high drag. But is it possible to cheaply and fairly easily make modifications that can reduce this drag? We decided to find out. 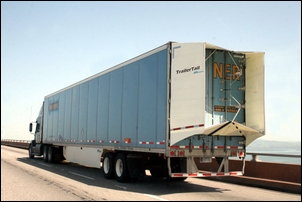 The incentive for exploring ways of reducing drag on square-back cars came from an engineering paper written on drag reduction techniques being used on semi-trailers (sometimes called tractor-trailers). In the paper Summary of Full-Scale Wind Tunnel tests of Aerodynamic Drag-Reducing Devices for Tractor-Trailers, Jason Leuschen and Kevin Cooper of the National Research Council of Canada test what happens to the drag of a full-size Volvo semi-trailer in 9 x 9 metre wind tunnel. The results of no less than 28 drag reduction devices are shown by the tests that were conducted in 2006. Most interestingly, the aero drag are shown not only as a change in Cd (drag coefficient) but also in litres of diesel that would be annually saved if the truck travelled 130,000 kilometres per year at a cruising speed of 107 km/h. The greatest saving in fuel (and so therefore the greatest drag reduction) was caused by the fitment of a Transtex Composite folding rear trailer deflector – a saving in fact of just over 3000 litres of fuel per year! The change in Cd caused by fitting this deflector was 0.05. Now known as the ATDynamics TrailerTail, this commercially available product comprises folding extension pieces that mount on frames attached to the rear doors of trailers. 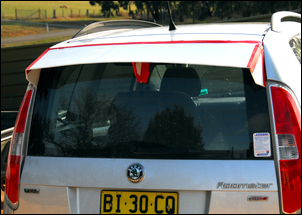 The extension pieces are angled inwards towards the centreline of the vehicle. If the airflow remains attached until the trailing edges of these flaps, the resulting wake will be smaller, thus decreasing drag. 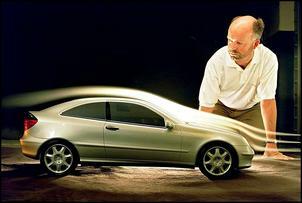 Furthermore, and while this is not stated by the company or the engineers who tested the device in the wind tunnel, it appears that trailing vortices normally being shed by the vertical rear edges may be altered in their characteristics. 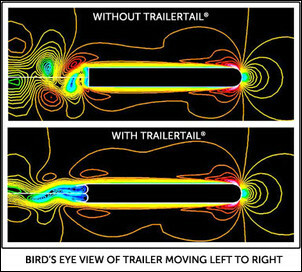 The company claims that fitting the TrailerTail reduces fuel consumption reduction at 105 km/h by 6.6 per cent. The TrailerTail philosophy has obvious implications for square-back cars. If the airflow can be directed so that it forms a smaller wake, it seems likely that drag will be reduced. …and a descending roofline – both attributes reducing the size of the wake. But additions designed to reduce wake size seem rare. Most spoilers/wings (usually they are neither!) either extend directly backwards or are angled upwards, so causing the wake area to be increased. 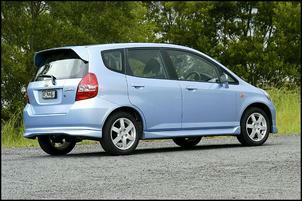 The mid-2000s Honda Jazz in VTi-S form used a large rear roof extension that does seem to tick the boxes of directing airflow for a (slightly) reduced wake size. 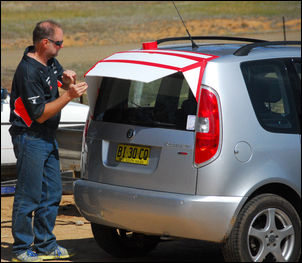 Rear extensions that are angled towards the centreline to reduce the size of the wake will work only if the flow remains attached to these guides. To put this another way, an abrupt change of angle of the sort that would be achieved with a roof extension angled sharply downwards will most likely cause flow separation at the change of angle. In addition, the flow will remain attached only if the airflow is already attached to the body prior to the extension. In other words, if the airflow has separated from the body ahead of the extension, the angled extension is unlikely to cause it to become re-attached. Therefore, extensions must have attached flow – both by being able to work with air that is already attached and also in keeping the air attached across their change in angle. 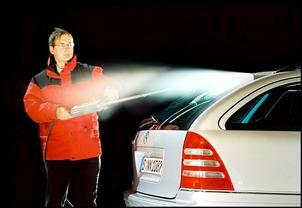 This might all sound like scientific gobbledygook that is irrelevant to car modifiers – except for one thing. It’s dead easy to see if the airflow is attached or separated. 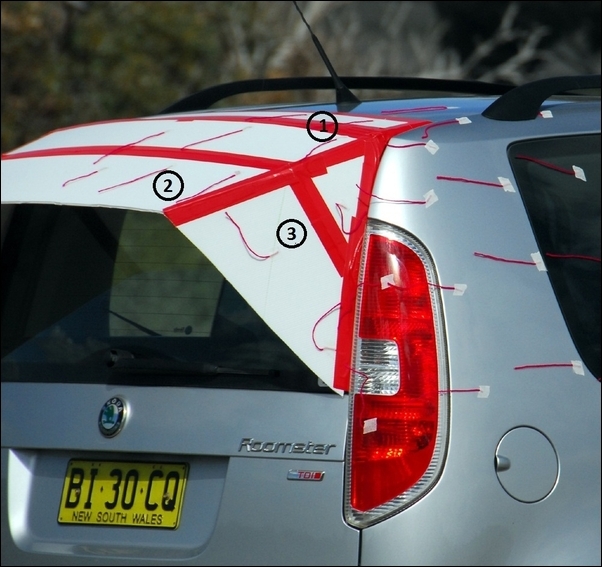 If small pieces of yarn or wool are stuck to the bodywork, the car is driven and the wool tufts observed or photographed, the behaviour of the air will be obvious. If the tufts all line up in rows, their ends fluttering only a little, the airflow is attached. In contrast, if the tufts whirl around, pointing in all sorts of directions and never stabilising, they are in non-attached flow. So seeing what is going on is as simple as sticking on a few bits of wool! 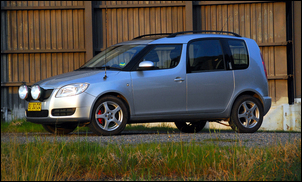 I wanted to reduce the drag of my car, a 1.9 TDI Skoda Roomster. In modified form the car is already very economical (typically gaining about 5.3 litres/100 in a 80/20 mix of highway and city use), but it seemed likely that with reduced drag, this could be further improved. The good thing about doing this sort of development is that it’s cheap and easy to see what kind of results are possible. I bought a piece of Corflute plastic sheet from a sign maker. The piece was 1800 x 600mm and 5mm thick - this cost AUD$45. 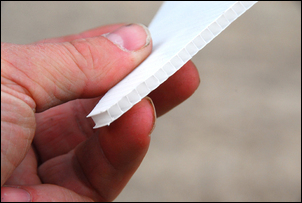 This plastic sheet, that uses two thin layers sandwiching a corrugated core, is light, easily cut with a serrated knife and sufficiently rigid to model extensions. With the rear extension in pIace I thought the aero noise level (from the back of the car aero noise tends to be a dull roar) was lower than previously, and the fuel economy on this trip was very good – a two-way average of 5.0 litres/100km. On the basis of previous trips, I would have expected a best of about 5.2 litres/100km. This was encouraging – although not absolutely definite. I then made the roof extension even longer (ie the maximum that was practical on the car) and wool-tufted the area. 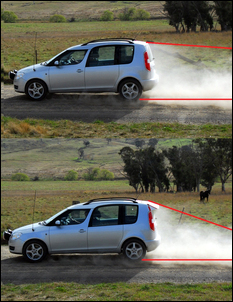 With the car being driven by at 60 km/h, I was able to photograph from the side of the road the behaviour of the tufts. The tufts showed a mix of good and bad. (1) The flow across the roof and onto the extension was attached. (2) The flow across the extension itself remained attached. (3) However, the flow along the sides of the car around onto the supporting pieces became separated. After these changes, the flow across both the top and the side pieces remained attached. But was the design reducing the size of the wake? 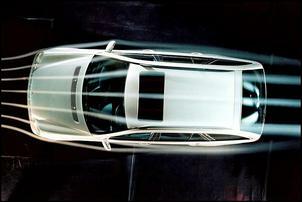 In the wind tunnel the size and shape of the wake can be determined by injecting smoke into it. Because the area is a lower pressure, the smoke tends to stay in the wake, so making it visible. Driving the car on a dirt road can also reveal the size and shape of the wake, with the dust generated by the tyres filling the wake. Testing with and without the roof and side extensions showed very clearly that the wake was smaller in modified form. I then did a lot more open-road road testing, watching fuel economy. With one configuration of roof extension I noticed that the fuel economy improvement seemed to have disappeared. However, careful observation showed that the unbraced rear Corflute extension was being lifted by the airstream, resulting in no downwards angle to the extension when travelling at highway speeds. I made another version, braced in the middle and with a slightly steeper, shorter extension. 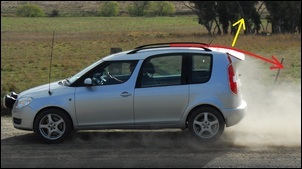 Note that this version attached only to the hatch – not so good for side aero but much more practical for a longer Corflute trial. 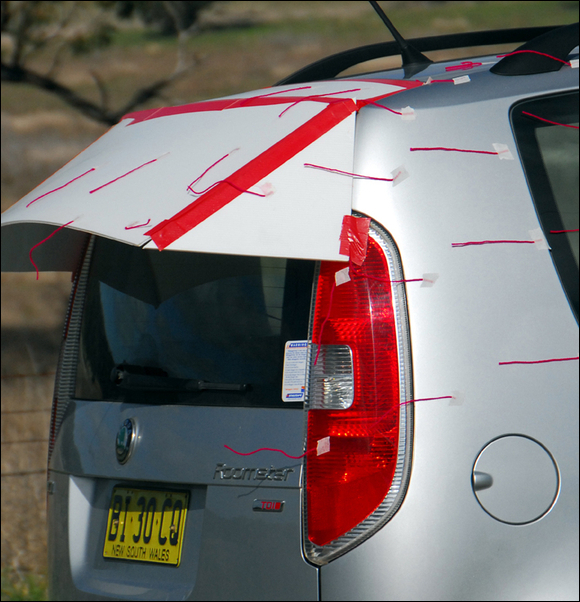 However, testing with this design showed that fuel economy was no longer improved – it was back to standard. So what was going on? When attached airflow wraps around a corner, low pressures are generated. If the airflow was remaining attached across the roof and rear extension (shown by the red arrow), it would be likely to be generating a force (yellow arrow). This force has an upwards component (lift) and also a backwards component (drag). 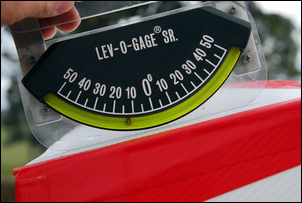 If the drag created by this low pressure more than offset the reduced drag caused by a smaller wake, the result would be no improvement. I measured the angle of the rear extension and it was about 20 degrees to the horizontal. I then made a revised version that decreased this angle to about 12 degrees (pictured). Many weeks of highway testing were carried out with this extension in place. During this test I consistently gained fuel economy about 0.1 litres/100km (a few per cent) better than I would have expected. However, perhaps more significantly (and as I also found with a custom front undertray on a Prius – see Modifying Under-Car Airflow, Part 2), the best-ever fuel economy results were clearly better - in fact 8 per cent better than achieved without the rear extension. The changes in aero drag (as reflected in fuel economy) were not startling. However, changes were detected in the observed patterns of the wake, and depending on the angle of the rear extension, fuel economy decreased. All food for thought if you have a squareback car and you’re chasing best fuel economy!